Lockefield Gardens Apartments was one of the first group of peace time projects initiated, funded, and supervised by the Federal Government as part of the recovery programs of the New Deal. Completed in 1937, the apartments are innovative in design, based on European prototypes of housing and urban design of the 1920s and the principles of the International style. This complex was the nation’s first experiment in high rise public housing. It also has very significant associations with the black community. The Great Depression hit already economically disenfranchised African Americans hard in Indianapolis. Neighborhoods adjacent to the Indiana Avenue corridor were filled with deteriorated wood frame cottages. In an attempt to aid the black community, city leaders requested a Public Works Administration (PWA) grant to construct new apartment housing to eliminate the deteriorated housing. Lockefield was one of an initial batch of 51 projects that PWA sponsored nationwide in the mid-1930s. 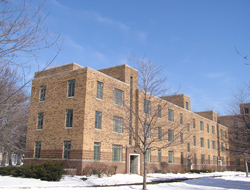 Authorities hired Indianapolis architects Merritt Harrison and William Earl Russ to design the complex of 24 buildings with 748 units, on 22 acres of land. The two turned to guidelines offered by the PWA’s Housing Division, as well as European housing models. The resulting design of a series of chevron-shaped, crisply detailed International Style buildings was unprecedented in Indianapolis. The buildings served black families into the 1970s. As part of a redevelopment scheme in the early 1980s, all but seven of the original buildings were demolished. Today, however, life has returned to the Avenue and infill apartments have filled the vacant land. Lockefield Gardens Apartments is located at 900 Indiana Ave. Apartments are private and not open to the public. INDYGO bus line from downtown: #34 Michigan Rd., disembark at West and Indiana; walk northwest on Indiana to the complex. Lockefield Gardens has been documented by the National Park Service's Historic American Buildings Survey.